This entry was posted on February 24, 2016 by Christopher Martin. 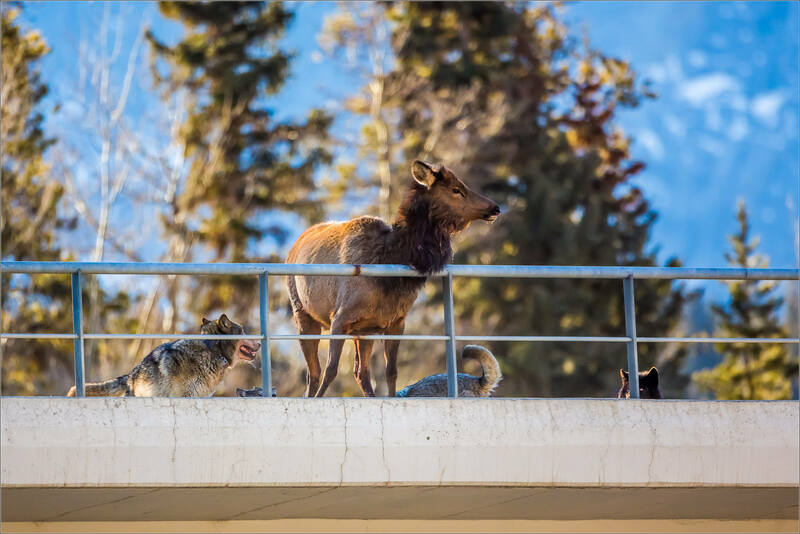 It was filed under Alberta, Animals, Banff National Park, Wildlife, Wolves and was tagged with alberta, animals, Banff National Park, Canada, elk, hunting, nature, wildlife, wolf, wolf pack, wolves. Excellent photo story, Chris. Jawdroppingly powerful documentation. Just discovering this story. 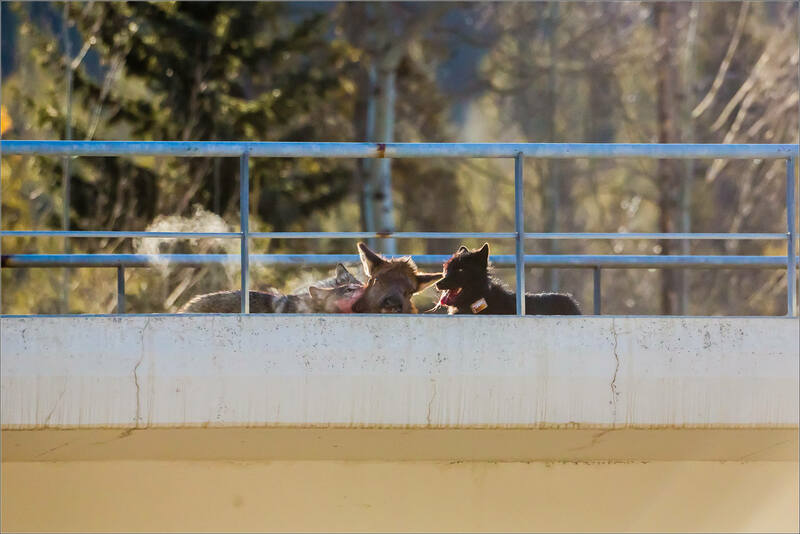 I can’t help but notice that the bridge in this case (which is unnatural and man made) played a part in this hunt and how it was used to trap the elk. The wonder of nature, and the wild! 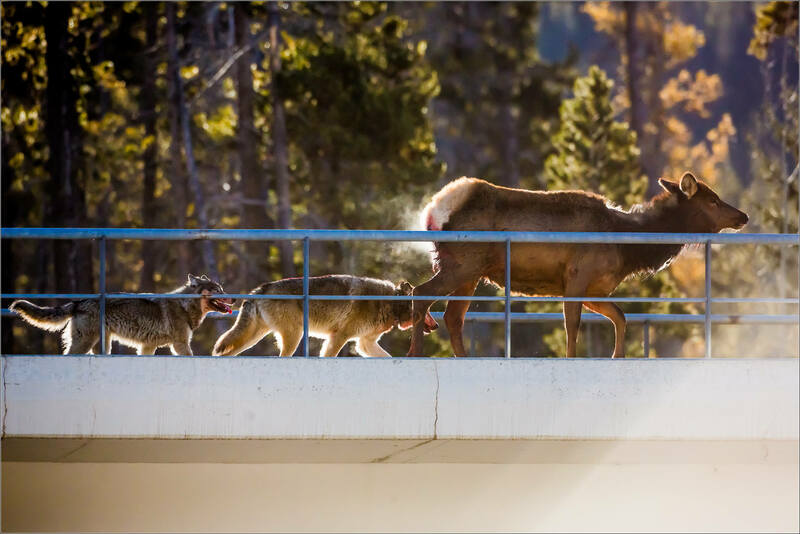 Looks like you’ve captured a hungry crew and a lone, worried elk… but not for long. Great shots! Wow, talk about right time, right place! Skillfully captured as well, graphically represented but not overly so. The effect the temperature added is probably a once-in-a-lifetime event (well, it is Canada, so maybe not, lol). Thank you for allowing us a peek over your shoulder at an inspiring and sobering moment in the circle of life. Absolutely stunning pictures! I can’t believe you were able to witness this! Banff is a town in the Banff National Park with ~8000 people. 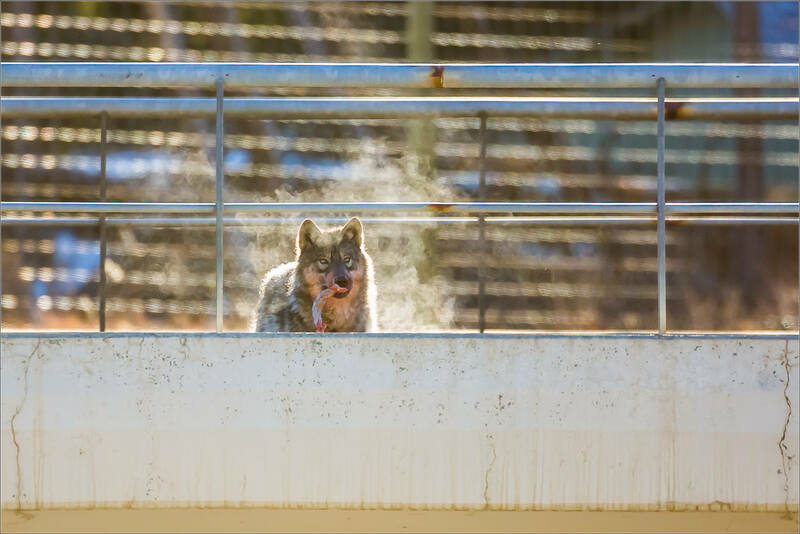 The wolves very rarely come into the outskirts of town – they do not roam there often more when they are transiting to another part of the valley. This bridge is a railway overpass that is about 1-1.5 miles outside of the town. 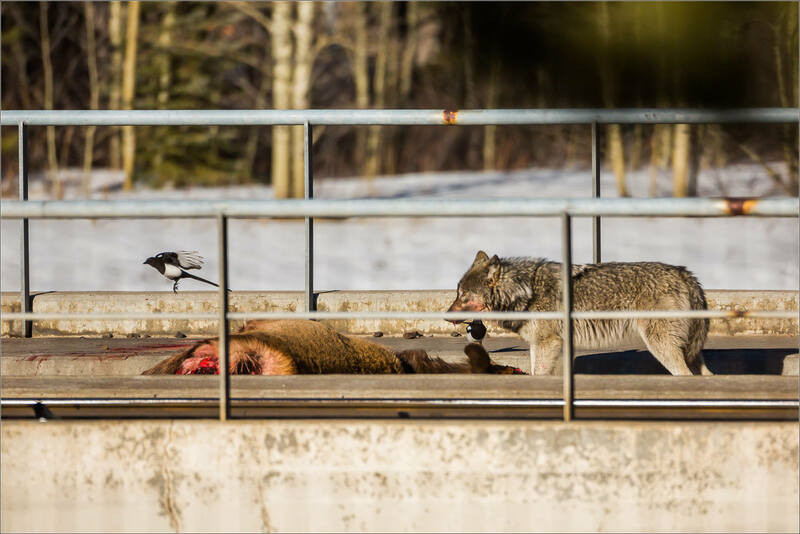 It is rare for the wolves to get hit by cars but it has happened. Thank you the story, and amazing pictures! I would have done the same thing. What a scene! 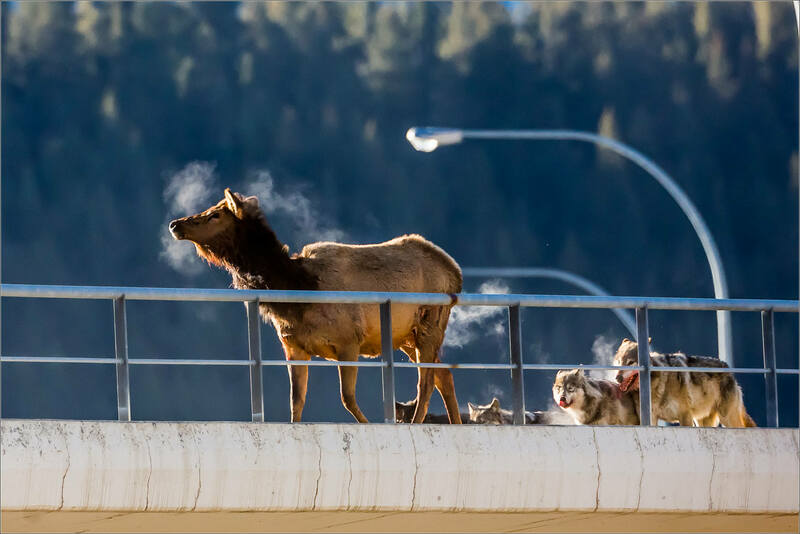 I love the shot of the elk looking over the railing, and on the underside of the bridge is a bunch of cameras. Wow, I am amazed at this series of photos and the scene you witnessed… Seeing this in the wild would be something else, but to have it happen at the crossroads between the wild & modernity, simply amazing. Your shots show the essence of nature so cleanly ~ and the intelligence of a wolf pack. Wonderful series of photos and discussion. fantastic pics. But wolves have no business being that close to a town. You won’t think there so cool when they eat fluffy or attack your children. We are the intruders to nature, especially as our towns and cities expand…not them to us. We need to learn to live with them. Wolves don’t attack people. There has not been a verified incidence of a wolf attacking a person. Really? At Points North Landing in Saskatchewan about 10 years ago a guy was killed and partially eaten by wolves. I guess that puts your theory in the fail column. If you live in a National Park you have to accept that the wildlife are free to roam wherever they want. Keep fluffy inside and don’t let your kids wander around unless you want them to be part of the food chain. 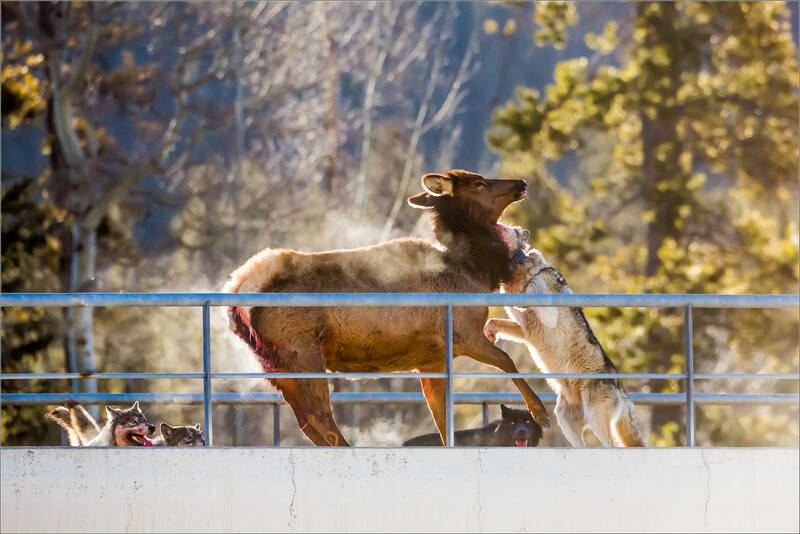 Nicely photographed, but I feel sorry for the deer, why can not the wolves make a quick end to the suffering. They obviously want to kill it as quick as they can but they don’t want to endanger themselves in the process. This is nature at work and a lot of animals do not die peacefully in bed. Just awesome! Great pictures and descriptive narration. I do have one question though, What were the sounds like?? 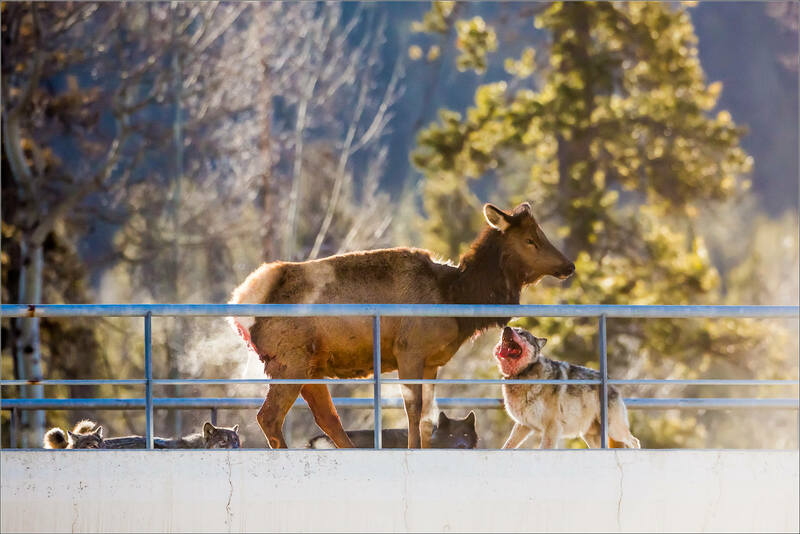 Did the wolves bark/growl in the process….did the elk “cry out” at all, or were the sounds subdued? It was very quiet. I was surprised by that – very few growls that I could hear from 100-150m away and no cries from the elk. Just amazing. Thank you for the experience. Wild animals doing what wild animals do every day. Amazing pictures, thanks for taking the time to record something most will never witness. Wow. Gripping story. I love the photos, makes me feel like I was right there. Well done and thanks for sharing. Powerful as has been said, but also I truly appreciate the blog format, instead of simply giving us a gallery of images! 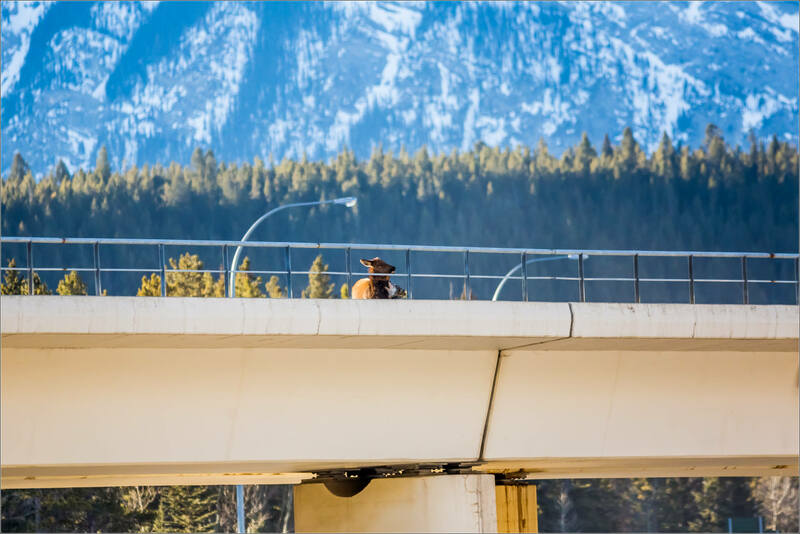 Nature is always telling us a story – so thanks for depicting it here… and that it happened there vs. out in the trees is cool and scary at the same time for Banff! Just curious, what is it I’m seeing behind the wolves in the third- and second-last photos? Is that a train going by?? Incredible photos, Mr. Martin! Gorgeous photos of nature in the raw. You were so lucky to be in the right place at the right time! 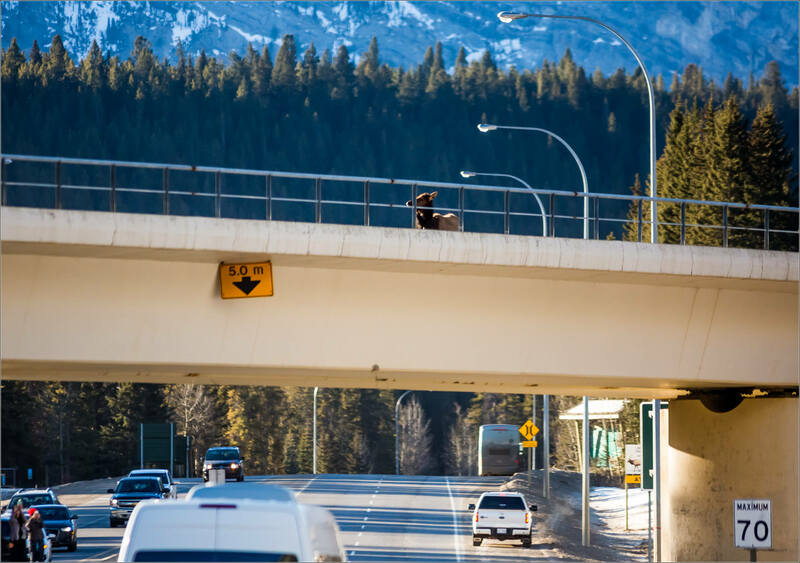 So many times I have headed under that bridge going to see if we could find wildlife in the Lake Minnewanka area. Great job at getting the shots and describing the scenes – a rare treat to witness the incredible precision of a Wolf pack in action. Thank you Gord. It was very lucky and an incredible encounter to witness. I wouldn’t interfere for any reason. I do not feel that I should have done anything different. Photographers should just capture these kind of natural take downs between two wild animals. This sort of thing happens daily in the wild you did the right thing by it run it’s course. Great pic by the way. As a nature photographer I agree. We record nature in it’s beautiful and not so beautiful moments, but we are there to capture nature not interfere with it. Besides what could you do? Run over there and try to chase 5 100lb hungry wolves away from their meal? You would just become the appetizer. Nature at it’s finest moment, yet worst. Thank you. The wolves must eat,..and no one is putting a bowl of food down for them each & every day… all of them are gorgeous creatures. Great respect for how this story was shared and for the decision makers involved in wildlife management. I find it difficult to express my appreciation of your photo work,your attitude and the attitude of those who commented on a very sensitive subject where I spend much time — Montana / Alaska. Your comment ” As I saw it now,” very, very good. My comment,”You can learn a lot from a WOLF!” Hope to see you in Banff on my way to Alaska next mo. An amazing documentary on a kill. I have heard of this ability for wolves to work as a team. I sympathize with the elk but nature is what it is. Wow! Amazing thank you for sharing. What a powerful experience that must have been. Survival of the fittest in action and pity on the poor victim. Your photographs are always a blessing because they are a flash of everything that is inspiring about nature. Grateful. Fantastic! Thank you for sharing these pictures of nature/life that we rarely see. I only hope that this pack moves away from the town. Watching these magnificent creatures in action must of been a personal highlight! Interesting story. Thanks for observing and photographing the hunt. Also interesting to hear about how Parks Canada intervenes in such situations. Do you know if coyotes hunt in packs the same way? Amazing pictures Chris, Just how far back were you? Between the off ramps or closer? Hi William – thank you! I was on the rise beside the the west edge of the bridge. About 150m from the wolves. Awesome pictures, thanks for sharing. Just how far away were you? Between the 2 exits from the TC? I think two of them are collared. Parks were telling me that they have alternate “on” times to stretch the battery life out. Wow. Thanks for sharing your wonderful photos with us. Amazing pictures! The brutal, beautiful process of nature taking its course even in the midst of human footprints on the landscape everywhere! How cool that you got that close to nature in action!! 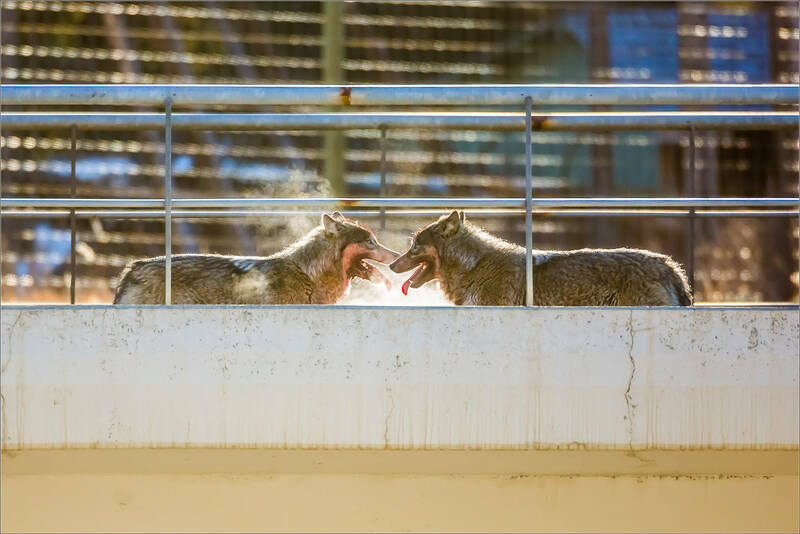 Seeing the Wolves’ teamwork in action would likely be the best part and you got a ringside seat! You would have loved it Lyle – you are absolutely correct that was one of the best parts. What an incredible capture, for everyone. Very powerful. Thank you Steve! I will need to check that video out. Incredible images. Good on you for stopping to capture these. Amazing display of nature! As sad as some will think this is, it is life in the wild. Great photos. Must have been truly powerful to witness. Congratulations on your pictures and by consequence you showing up on my CBC feed. What amazingly powerful images! Well done. Excellent images … in particular the penultimate one of the lone wolf facing the camera.